News from LMCU: New Byron Center Branch Is OPEN! New Byron Center Branch Is OPEN! Located at 675 68th Street SW, just east of Clyde Park Ave., at the southwest corner of the US 131 and M-6 (Paul B. Henry Freeway) junction, LMCU’s newest branch is ready to serve you. If you’re a GR south-sider, stop in and say hello! Watch for official Grand Opening event details coming soon! 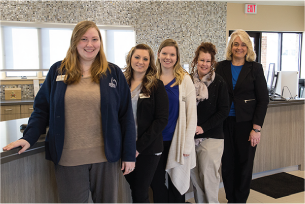 From Left to right: Abigail Venhuizen, Rachael Deater, Erin Wahl, Tracy Hofstra, and Janice Stokfisz (Branch Manager).